Abstract. Global warming has a significant impact on the regional scale on the Arctic Ocean and surrounding coastal zones (i.e., Alaska, Canada, Greenland, Norway and Russia). The recent increase in air temperature has resulted in increased precipitation along the drainage basins of Arctic rivers. It has also directly impacted land and seawater temperatures with the consequence of melting permafrost and sea ice. An increase in freshwater discharge by main Arctic rivers has been clearly identified in time series of field observations. The freshwater discharge of the Mackenzie River has increased by 25% since 2003. This may have increased the mobilization and transport of various dissolved and particulate substances, including organic carbon, as well as their export to the ocean. The release from land to the ocean of such organic material, which has been sequestered in a frozen state since the Last Glacial Maximum, may significantly impact the Arctic Ocean carbon cycle as well as marine ecosystems. 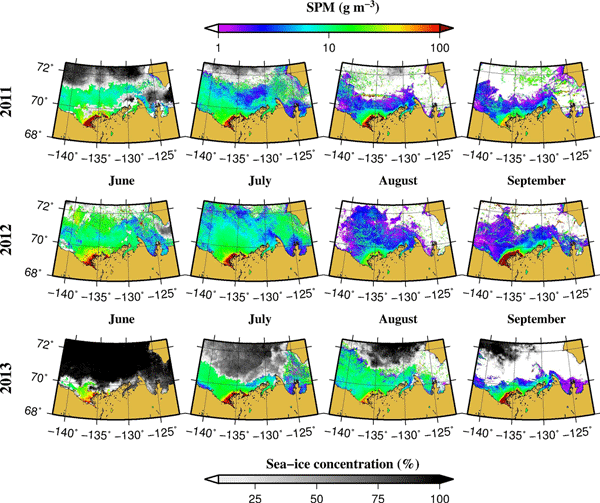 In this study we use 11 years of ocean color satellite data and field observations collected in 2009 to estimate the mass of terrestrial suspended solids and particulate organic carbon delivered by the Mackenzie River into the Beaufort Sea (Arctic Ocean). Our results show that during the summer period, the concentration of suspended solids at the river mouth, in the delta zone and in the river plume has increased by 46, 71 and 33%, respectively, since 2003. Combined with the variations observed in the freshwater discharge, this corresponds to a more than 50% increase in the particulate (terrestrial suspended particles and organic carbon) export from the Mackenzie River into the Beaufort Sea. 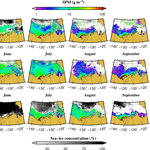 How to cite: Doxaran, D., Devred, E., and Babin, M.: A 50 % increase in the mass of terrestrial particles delivered by the Mackenzie River into the Beaufort Sea (Canadian Arctic Ocean) over the last 10 years, Biogeosciences, 12, 3551-3565, https://doi.org/10.5194/bg-12-3551-2015, 2015. Eleven years (2003-2013) of satellite data were processed to observe the variations in suspended particulate matter concentrations at the mouth of the Mackenzie River and estimate the fluxes exported into the Canadian Arctic Ocean. Results show that these concentrations at the river mouth, in the delta zone and in the river plume have increased by 46%, 71% and 33%, respectively, since 2003. This corresponds to a more than 50% increase in particulate export from the river into the Beaufort Sea.